Calvin L. Smith: Review of "Christian Zionism: Road-map to Armageddon?" Sizer's book is unnecessarily polemical and pejorative. It is also strongly biased. Sizer is closely associated with a Palestinian ecumenical and liberation theology movement called Sabeel, which sides very strongly with the Palestinian cause and vociferously condemns Israel. Although Sabeel’s founder, Naim Ateek, has condemned suicide bombings, his statement is qualified by seeking to understand why suicide bombers do what they do. It is interesting to see also how, in the context of suicide bombings against Israel, Naim Ateek and Sabeel refer to Samson’s last act in the Philistines’ temple of Dagon. Thus, Sabeel’s position on suicide bombings appears somewhat ambiguous. (For details, see www.sabeel.org/old/news/cstone25/suicidebombers.htm). Its pejorative and biased nature means the book is not as objective as it might be, which weakens its scholarly impact. Actually, these flaws are a pity because Sizer makes some valid points concerning extreme dispensationalism. He also highlights some of the dangers of an “Israel right or wrong” mentality which some Christians hold. (Even many Jews do not take this position.) Other valid points Sizer makes are how at times dispensationalism is theologically arbitrary, the extreme nature of what he calls “political dispensationalism”, the very real theological pitfalls of seeking to read every piece of news and current affairs through the spectacles of biblical prophecy, and the desire by some pro-Israel Christians to offer God a `helping hand’ in seeing those prophecies fulfilled. God does not need our help to fulfil His own prophecies, but Sizer manages to highlight how some Christian leaders think in precisely these terms, especially in the U.S., where they engage in political lobbying to bring pressure to bear on government policy so as to fulfil biblical prophecy on God’s behalf. Such a mentality is no different from anthropocentric postmillennialist Kingdom Theology attempts to usher in and present the Kingdom to Christ, thus hastening His return. A major problem with the book is that it dwells almost exclusively on extreme political dispensationalism, without any meaningful or fair discussion of theological support for the Jews by Evangelicals who are not dispensationalist. The view that the Jews continue to be God’s chosen people does not necessarily translate into the expressions of the forms of extreme Christian Zionism which Sizer describes. Moreover, a pro-Jewish theological stance is nowhere near as new as Sizer would have us believe. He looks back to the Puritans as the progenitors of a pro-Jewish doctrinal stance which he argues reaches maturity in nineteenth century dispensationalism. Yet arguably, support for the doctrine of the Jews as God’s people is the longstanding historic view of the church which, ironically, led to terrible anti-Semitic excesses by medieval Christians frustrated that God’s very own people had rejected Christ. Even that anti-Semite Martin Luther recognised the Jews still retained a special place in God’s hand. Sizer’s book also raises questions about his hermeneutical methodology. For example, as a typical covenantalist he believes most biblical prophecy has been fulfilled already (this position is known as preterism). A case in point is his interpretation of the abomination of desolation, referred to by Jesus in Matthew 24. Clearly, Jesus was alluding to the fall of Jerusalem to Titus in AD 70. Yet the passage also has eschatological significance: it is, after all, located in Matthew’s so-called eschatological discourse, and even a superficial reading demonstrates Jesus is using a soon-to-occur event to describe an eschatological scenario. Thus a Jewish understanding of prophecy as repeated history which can have several partial or illustrative fulfilments is lost on Sizer. Lest he think such a view is clear evidence of someone unable to shed their dispensationalist mindset, one need only consider Isaiah 7:14, which found an expression in Isaiah’s day, but also when Jesus was born. Both children represented a sign that marked the salvation of God’s people Israel. This leads to another hermeneutical problem with the book. Sizer correctly identifies how a dispensationalist hermeneutic (like any other) can predetermine the interpretation of the Bible. In this case, Sizer argues, a dispensationalist will always read the Bible along Zionist lines, leading to a tunnel vision which rejects all other interpretations. Yet Sizer falls into precisely the very same trap, quite unable to break away from his own strongly covenantal hermeneutic, to the extent that his interpretation of biblical prophecy is allegorised and preterised along established covenantal lines. Thus, Sizer engages in the very same dogmatic hermeneutics he condemns, rather than the exegetical objectivity he appeals for. All this aside, Sizer’s book throws down the gauntlet to Christian Zionists, and by extension, many Pentecostals, and thus merits closer inspection. After all, support for Jews as God’s people, and by extension the Jewish state, does not necessarily or automatically translate into support for a secular government of Israel, which is arguably somewhat more theologically difficult to justify. 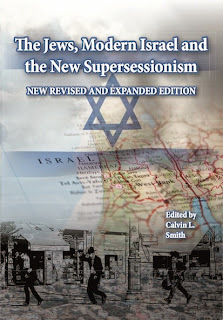 Aside from this book, there are several other recent academic Evangelical attempts to push anti-Zionism. There have been several theologically-meaty rebuttals, and Christians who support the Jews as God’s people do well to familiarise themselves with the current debate and seek to defend their position persuasively and effectively in a manner which is exegetically and theologically viable and nuanced. It is curious how much Sizer targets dispensationalism, if only he'd read the Puritans, M'Cheyne, Spurgeon or Bonar - he'd find his dichotomy between covenantal and dispensational theology frayed to disintegration. However personally I think you're too kind to him, Sizer's academic credentials are weak, and his works are filled with serious errors and some hallmarks of anti-Semitism (http://www.strateias.org/antiZionism.htm for a few), he recently described 'Isa as the Arabic name for Jesus - only Muslims would claim that! I think there are aspects of dispensationalism that show it to be an outgrowth from Calvin's type of Covenantal theology. I grew up in the Devon Open Plymouth Brethren and we were / are dispensationalists, but not all follow Derby's view - Derby strongly supported the Jewish movements and formed the break away Exclusive Brethren by splitting from the Open Brethren of the Bristol Bethesda fellowship. So it is possible to be a dispensationalist, in terms of how God relates to people through various covenant's of grace, and not be a Christian Zionist. Israel was founded by European Marxists. 90% of Jews are atheists. Israel is anti-Christ and anti-Christian because it is predominately an atheist country. For a Christian to support atheists is nonsense. Look at Hollywood and the media which is dominated by atheist Jews. The media is anti-Christ and anti-Christian as we know. Most Christians do not support the anti-Christ folks. Read the ADL site to see how much they hate Jesus.